The current study concerns the identification of possible differences in perception between the virtual and the real world in terms of the effect on brain activity. Brain activity was captured, through an EEG device, in different brain areas during an exposure to different virtual and real environments. The first aim of the experiment is to investigate if exposure to a virtual environment can affect motor, cognitive or other function of the users, and the second aim is to test if the graphics content and nature of such an environment can influence the user experience. Our results indicated a significant difference in each brain area, especially in the frontal and occipital region, when a participant was exposed to a non-realistic virtual environment, compared to a realistic one, highlighting the impact of the selected virtual environment design. The results of the experiment can play an important role in supporting the use of virtual reality-based applications in several fields, like Cultural Heritage as a more efficient method to provide a motivation and keep the brain focused. This case study is based on the paper Baka E., Stavroulia K.E., Magnenat-Thalmann N., Lanitis A., “An EEG-based evaluation for comparing the sense of presence between Virtual and Physical Environments” , presented on the Computer Graphics International 2018 Conference (CGI18) and published by the ACM proceedings. Virtual Reality (VR) applications are becoming a serious and highly promising method that can be applied in many fields, including entertainment, education, medicine. One significant reason for the importance of VR-based platforms lies in the ability of Virtual Environments (VE) to support multi-sensory training and to produce high levels of sense of presence allowing the users to feel as if they ‘are there’, while their body is physically located elsewhere . It will be a great challenge for learning enhancement if a link between brain activity and learning success through collaborative learning environments , such as VR, can be proven. The biggest deficiency in learning processes is the existence of a proper motivation. More and more services, like schools, museums choose to use VE to present educative scenarios in a more accessible and interesting way. But how our brain finally perceives and reacts to these scenarios? The easiest way to evaluate the sense of presence of VR users is through questionnaires. 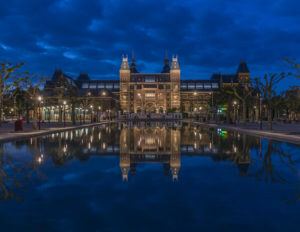 However, questionnaires are developed based on specific theoretical views concerning presence and can be effective in cases where existing experiences can be used as reference points during the process of evaluating specific behavioral outcomes . In the current study though, an EEG device was used to record the brain activity during the user’s exposure to the VE. 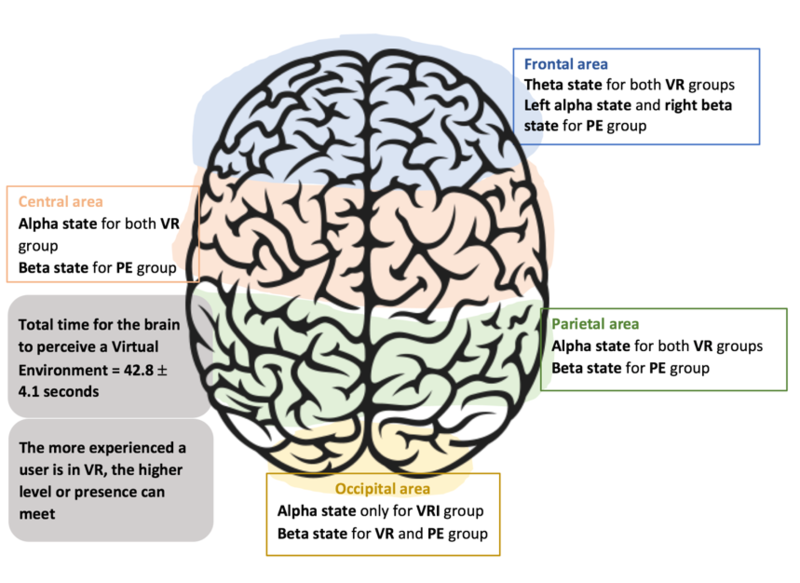 It has been proved that VR can simulate or rehash the neural activity induced by a Physical Environment (PE) and thus, VR platforms can be designed in such a way whereby they can create the desired and adequate differences between neural function in PE and VE . Therefore, through VR the quantification of the parameters becomes easier. An important question is whether the exposure to VR applications can indeed affect the brain activity of the user and consequently the user's cognitive, behavioral, motor or other function. Enough research has been done to determine possible effects on the brain and neural function, caused by the interaction with a VE, since the 1990’s. However, it has not yet been proven if all these results are reliable or which parameters can provoke this outcome, more research is needed to diminish any misinterpretations. Thus, based on the up-to-date state of the art our research questions are shown below. Is the Virtual Reality itself able to activate specific regions of the brain, influencing behavioral, motor or other functions? Does the design of the environment play a role? Which should be the most suitable features for a VE to be able to trigger desired functions and behaviors? How much time does the brain need to adapt to a VE? Consequently, which is the minimum duration that a virtual task must have to be effective? Thirty-three healthy adults (22 males – 66,6% and 11 females – 33,3%, aged from 25 to 59 years old) participated voluntarily in this study. During the experiments, volunteers were exposed to two virtual and one physical/real environment (PE) with the same scenario in all three cases. 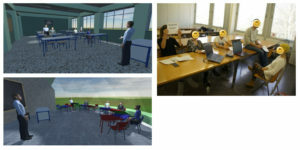 The scenario is based on a classroom environment and the user can see the environment through the eyes of the teacher or through the eyes of a student. Three different types of group were used. The first group (VR group) was exposed to a VE depicting a realistic classroom appearance in an attempt to create a strong sense of presence due to the familiarity with the environment whereas the second group (VRI group) was exposed to a VE showing an imaginary class environment. To validate the effect of the VE, a third group (PE group) was exposed to a real (physical) classroom space at the University of Geneva. For the needs of the current research a prototype application was developed as a first person three dimensional (3D) virtual environment, using the ‘Unity3D’ game engine. The avatars were created with the Maya Autodesk Character Generator student version and for the realistic immersive experience Head Mounted Displays and specifically the VIVE virtual reality headset was used as a means of viewing the application. EEG signals were recorded and amplified using a BIOSEMI Active Two 64 channel amplifier system. The analysis of the EEG data and the processing of the signal were carried out in MATLAB. The area of the brain was divided in 10 regions of interest according to the functions we wanted to examine. Brain rhythms, which we are mainly interested in, are theta (3-7 Hz), alpha (8-12 Hz), beta state (13-30 Hz) and low gamma (30-42 Hz). To provide our results with a higher validity, a reliable and validated questionnaire, named Igroup Presence Questionnaire (IPQ) was used. Our aim was to reveal the dominant frequencies, and consequently the dominant brain state, in different brain areas, examining the possible influence that a VE might have over a PE. Moreover, the use of the two different VE enables the definition of the features of each environment that can play a significant role in influencing the brain of the users, enabling the design of VE’s that enhance the educational process. Finally, we measured the average time that the brain needs to adapt to the new dominant state allowing the definition of the optimal duration of a task in order to be effective. Most of the differences between the three groups are statistically significant, especially between the groups exposed to the two VE’s and the group exposed to the Physical class. Regarding the frontal area, both VR and VRI groups were synchronized in theta state, around 6 Hz. Frontal theta can be associated with focused attentional processing and especially cognitive effort and novelty detection. We can also link this result with the possible motivation that a VE may trigger, due to its different set up and the multimodal feedback that it can provide. On the other hand, the PE group managed to be synchronized mainly in low beta state, which in this part of the brain can be linked to memory recall. Theta band power increases as a task becomes more demanding so this can explain its presence in the VE. In the PE, the participants simply had to handle the parameters they face in their everyday life. To the best of our knowledge, no theta activation has so far been observed in frontal regions during a VR experience. As far as the central areas were concerned, in both VR groups we noticed a synchronization in alpha power, which, in the central part of the brain, can be associated with creativity-related demands and the process of producing new ideas. 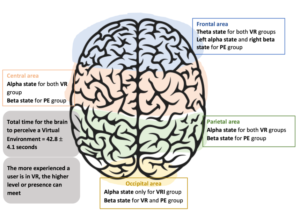 However, it is surprising that in PE we just noticed the presence of the beta state as the difference between the VR groups and the PE is highly significant. In the parietal areas, we got exactly what we expected, in line with different results reported in the literature. We confirmed the dominance of alpha power, which has already been used as an indicator or presence, compared to the PE group that was synchronized only in beta. We also examined the activation in the occipital lobe. It is interesting that only the VRI group managed to be synchronized in the alpha band, indicating the recruitment of visual attention mechanisms. In general, the increase in alpha power in posterior brain regions can indicate qualitative information processing and the fact that we noticed it in both parietal and occipital lobes mean that probably there was an efficient recruitment of the desired networks. Moreover, we noticed that the VR group needed slightly less time to process the information and consequently adapt to the new brain state. 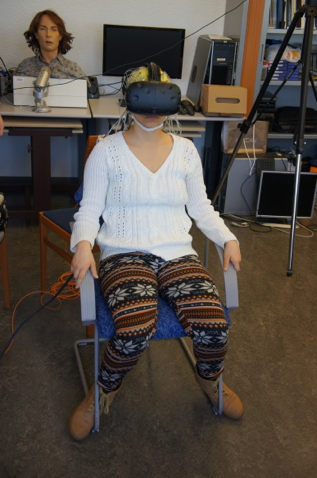 It is worth mentioning that through the questionnaire we noticed that the VR group was more aware of the real environment, paying attention to external stimuli, compared to the VRI group. This can also be correlated with the impact of the design of the VE. We conclude by summing up brief answers to our initial research questions. First of all, we showed that VR itself can influence the function of the brain, having a different effect in the different brain areas. This means that it can be used for several behavioral, motor, cognitive or other function’s purposes. Secondly, we found differences between the two VEs, mainly in frontal and in occipital lobe, indicating, at a first rough stage, that the design and the graphics of the environment do play a role in the aforementioned effect. Lastly, we found that the average time the brain needs to perceive and be adapted in a VE is 42.8 sec (SD=4.1 sec). This reveals that any application, developed in VR, needs to last at least for 42.8 seconds in order to be effective. Our results can reveal the real reaction of our brain to a virtual reality experience, as the up to date technology can support it. The point is that, for the time being at least, it is more efficient to use virtual reality to help the brain to learn things and keep it focused on specific tasks.